APX’s thin-line body combines incredible comfort, easy top-fret access and a sound perfectly suited to on-stage use with bright, clear mids, balanced highs and controlled lows. Specially designed non-scalloped X-type bracing allows the guitar’s top to sing and maximizes the resonance of the unique body shape for a full, natural tone. With dynamics, sensitivity and clarity built into the design from day one, APX is a guitar not to be underestimated. The APX’s thin-line body offers incredible comfort, top-fret access, and a sound perfect for on-stage use. 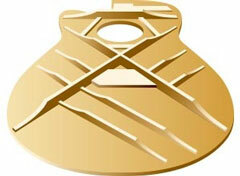 Specially designed non-scalloped X-type bracing maximizes body resonance for full, natural tone. Their wide dynamic range, excellent sensitivity, and outstanding clarity make them impressive performers. 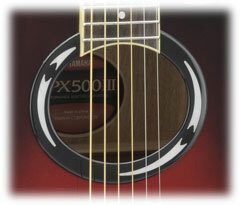 The instantly recognizable APX soundhole thickens lower-mid response and gives a more strident, open low end. 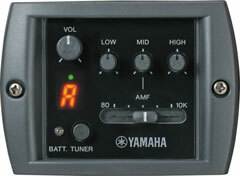 System 66 features an under-saddle piezo pickup developed by Yamaha. Controls include a 3-band equalizer, an adjustable mid-range frequency control, and a precision chromatic tuner for optimum sound tailoring. The system is powered by easy to obtain AA-size batteries that provide a stable power supply for improved sound quality.